Job scope: Assist in the creation of a Mead & Cider tasting room-brewery in Carpinteria, California, using locally salvaged and recycled materials. The space as it appeared prior to signing the lease. Making space: Walls removed and existing loft area supported. 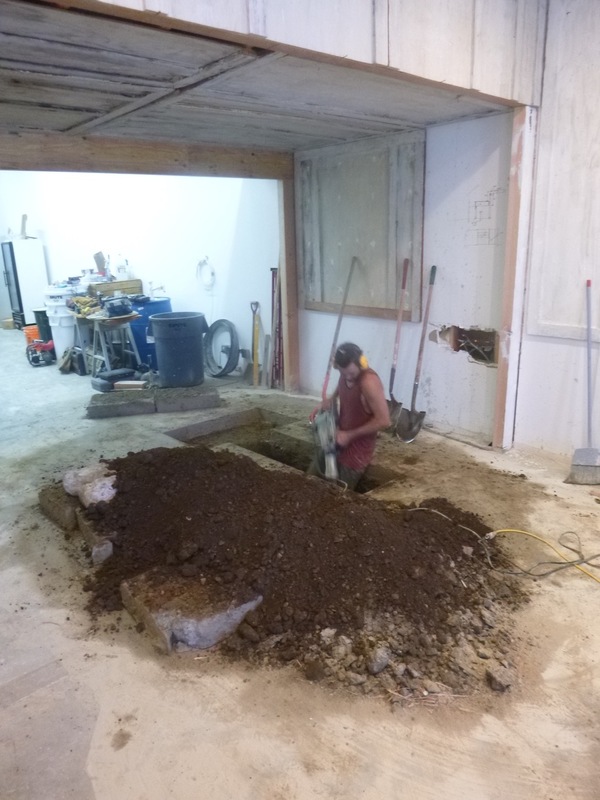 In search of the building's main drain line: Creative director, brewmaster, and owner Nole Cossart digging deep. Note the salvaged wall panels from discarded furniture storage units. Lunch break: Nole Cossart and Rachna Hailey Sagar rest atop the newly installed 24' recyled refrigerated shipping container. Locally sourced: The first load of organic cider apples arrive for brewing into the Apiary's first libations. 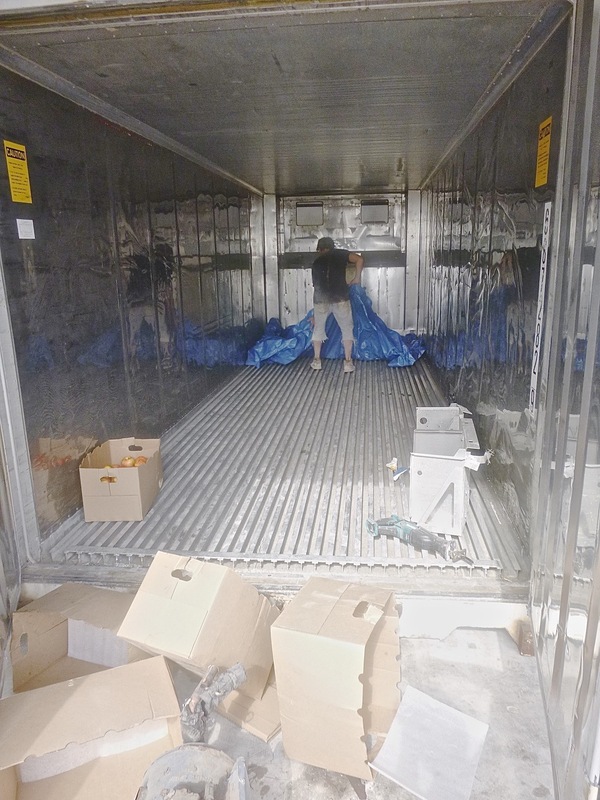 Infastructure: Nole prepping the backside of the tap wall from the inside of the shipping container. Course correction: The search for the drain line was revised and happily concluded. The old dig site was repaired but not forgotten. 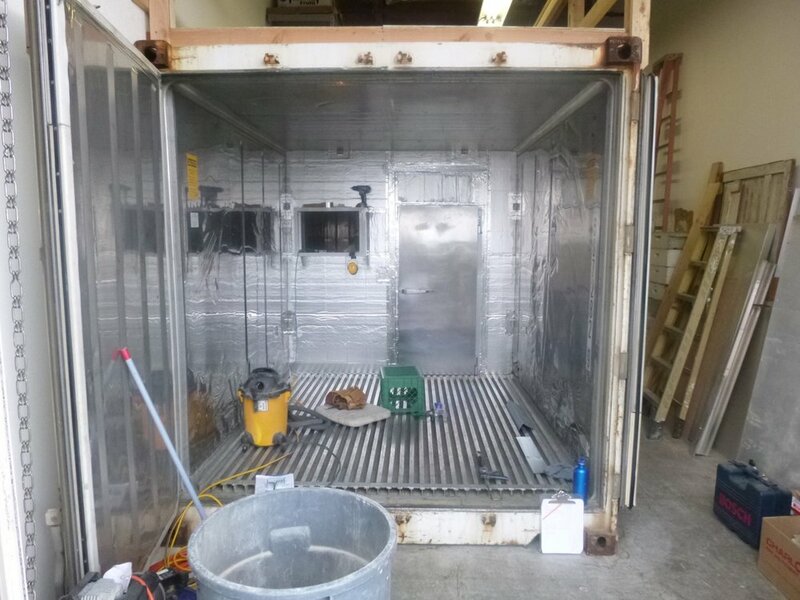 Remodeling: The container was partioned in half to maximize storage types. Kegs in the cold zone beyond the insulated wall, non refridgerated items on this side. Note the salvaged entry door. 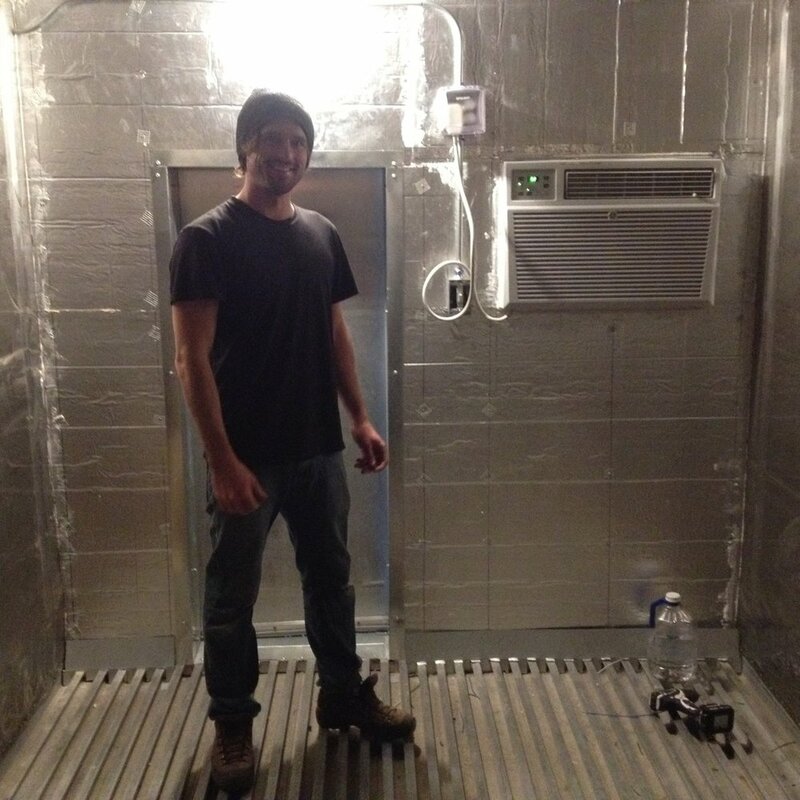 Keeping cool: Thanks to Mark Taylor's help, of Mark Taylor Electric, Nole is happily enjoying his new refrigerated space. 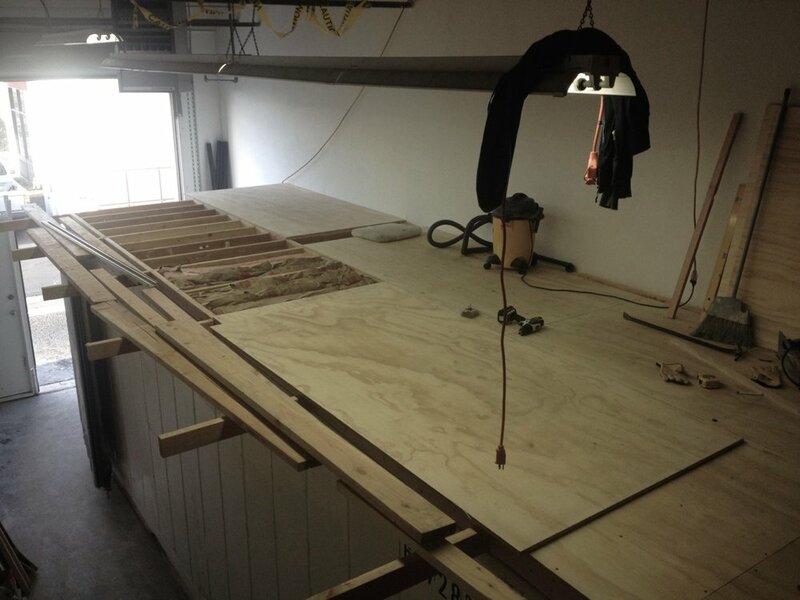 Expanded loft work zone: The top of the container becomes the platform for the brewing activities. Up and running: Nole shares his brew methods with attorney Brian Daly. More DIY: Recyled redwood railroad ties / fence posts salvaged from a local ranch becomes the bar top. On the level: Nole ponders his handiwork. A recyled sink unit finds a permanent home. Staging: The taps are mocked up from old oak barrel staves, the face of the bar is salvaged pasture fencing. Hints of an Apiary: Nole installs bee hive box parts to the tap wall. Original font: Nole's branding vision included the lettering he created for the business. Ship shape: All the bar stools were made from salvaged fork lift pallets. Golden: The final taps installed. In the fridge: The connection of the 5 gallon kegs begins. Interior decorating: Patio lights illuminate paint application of Nole's own custom-made whitewash. It's official: Come on down to 4191 Carpinteria Ave, Carpinteria, Ca. Open Fri. 4-10 PM, Sat. 2-10 PM, and Sun. 2-8 PM. Nine taps: Flights of 6 are served on repurposed bee box parts. Old school: Select antiques enhance the intimate and light filled space. At rest: Nole and Rachna relax before the Friday rush. Saeja plays under the stairs by the piano.